We were looking at the new £5 note that has been recently issued for last week's Finance Fridays. 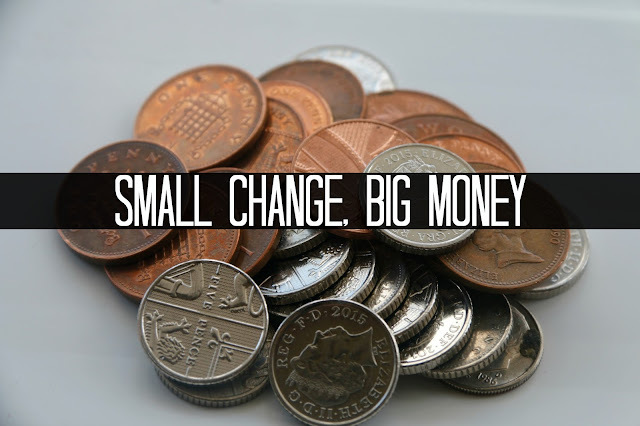 This week it's still about the money in your pocket in the form of coins. The hobby of collecting coins or numismatology as it is officially termed has become popular for both the amateur and professional collector. Whilst the change you have in your purse, under the sofa or in a money box may not be worth a fortune it could certainly be worth more than its face value. Let's have a look at some of the coins to keep an eye out for. Decimalisation came into use in the UK in 1971 and with it a whole new set of coins. Only two of those coins remain in circulation today with their original size – the 1p and 2p. Since it has been 45 years since the original coins were introduced the ones issued in the 1970s are now becoming rarer as damaged coins are removed from circulation and others are simply lost. In the pile of the coins above the earliest 1p in the batch was from 1990. This week on eBay I have seen a 1971 1p coin selling for £100. Some coins are collectible because the Royal Mint deliberately issued them as limited edition designs whilst others are design or minting faults that have slipped through. One of those is a batch of silver 1p coins. Due to their size they could easily be mistaken for 5p coins. From 1971 to 1981 on 1p and 2p coins the words 'New Pence' was on the back on them. From 1982 on the 2p coin 'New Pence' was changed to 'Two Pence' however in 1983 a batch was minted with the old 'New Pence' inscription on. Most were put in collectors' packs but some made it into general circulation. Another design mistake was made in 2008. The 20p coin had a slight redesign with the Royal Mint shifting the date from the back of the coin to the front. In all of this moving about a number of coins ended up with no date stamp on at all. Have a look here at how to identify one and remember the only rare coins are the 20 pences without any date on at all. - 50p from 2009 minted to commemorate the 250th anniversary of Kew Botanical Gardens. The Royal Mint describe it as 'the rarest coin design in current circulation'. - £2 coin from 2012 commemorating the 200th anniversary of Charles Dickens' birth. Only 20,000 were minted. - 50p EC Commemorative coin 1992-1993. There were 109,000 issued but it is no longer in circulation as the 50p coin was reduced in size in 1997. - £2 Mary Rose, 500th anniversary and £2 King James Bible 400th anniversary coins from 2011. Both were limited edition coins released in small numbers. - For London 2012 Olympics 29 different designs of 50p were issued. A full set can sell for around £35. Some of the more popular designs such as the football coin with the offside explanation on and the wheelchair rugby are selling for £3-4 each. The rarest coin in this set is the original aquatic 50p with the water going over the swimmer's face. Just 600 of these was released before it was altered to show a clearly visible face. Have you got any rare or collectible coins? Do you check your change for any unusual coins? If you want to join in with this week's Finance Fridays then add your link to the linky below. Any post concerning financial matters is allowed. Full details here. It doesn't have to be published today as you have until 23.55 on Tuesday 27th September 2016 to join in. I love all the information in this post - it's something I wouldn't seek out myself to learn about but it's quite interesting to know all the same! I just spent my coins or put the copper in to a jar for holiday time! Oh this is brilliant and a great way to keep the kids occupied. I'm going to send them off looking to see if we have any valuable coins! I didn't know any of that, my son will be enthralled!